When it comes to choosing a material for their kitchen countertops, homeowners have no shortage of options. Depending on taste, style, and budget, there’s a kitchen countertop material to perfectly complement any kitchen remodel. Below we’ve outlined some of the most popular materials for kitchen countertops, along with some pros and cons of each material. If need some help choosing the right kitchen countertop for your remodeling project, our team is always here to help - feel free to contact us with any questions! Among homeowners we work with, quartz continues to gain popularity and is by far the most common slab material specified by our interior designers. 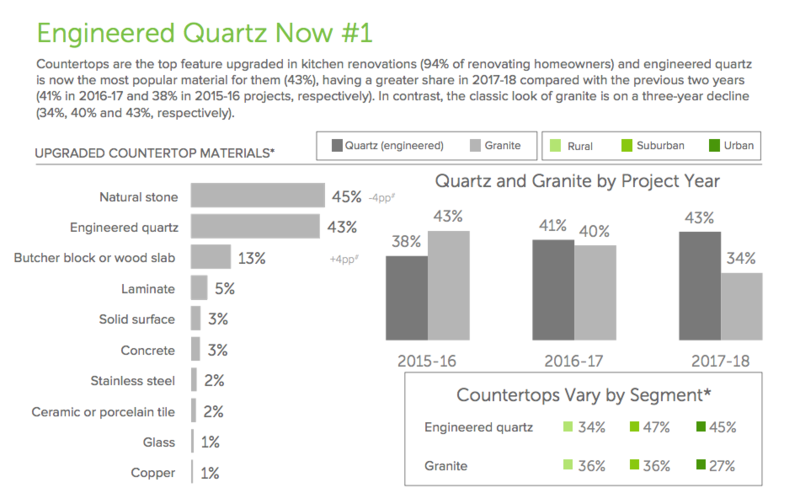 Our experience with quartz’s popularity was also highlighted in Houzz’s 2018 U.S. Kitchen Trends Study, which reported that engineered quartz has finally overtaken granite the most popular choice for kitchen countertops. Engineered quartz countertops are manufactured into sheets from natural quartz, a non-porous, super-hard mineral. With no sealing is required, a growing color palette of natural hues, soft textures, and multiple patterns, quartz is a practical, popular choice for homeowners. In fact, the technology behind engineered quartz countertops is so great, it can be nearly impossible to tell quartz from a more expensive granite or marble countertop. Some of the the most common names in engineered quartz are Zodiaq, Silestone, and Caesarstone. Engineered quartz provides very consistent coloring with no veining and is basically maintenance-free. Additionally, uniform slab sizing creates a seamless look to your kitchen countertops. The biggest drawback to engineered quartz is its price, which is comparable to natural granite. It’s also slightly less heat-resistant than granite, and may be prone to chip or crack near the edges under heavy impact. Engineered quartz countertops match up favorably to the once-dominate granite when it comes its wide color palette, pattern uniformity, seamless installation, and low level of maintenance. Until very recently, granite slab was the most popular finish choice for kitchen countertops. 10 year from now, natural granite will look like the day it was installed with very little maintenance. Daily cleaning with mild soap and water and applying sealer every couple of years is all that is required. Granite slab comes in an endless array of colors, it’s extremely durable, and requires very little maintenance. Exotic colors can be pricey. Fabrication is more expensive than solid surfaces like Corian, and is also more susceptible to staining than engineered stone finishes without regular sealing. While a quick daily washing of soap and water will suffice, granite countertops do require a bit more maintenance than quartz or other engineered stone finishes. Granite slab counters are an excellent choice for just about any application if you can afford the moderate to high price. If you do go the natural route with granite countertops, make the commitment to seal, clean, and care for them properly to extend their lifetime. 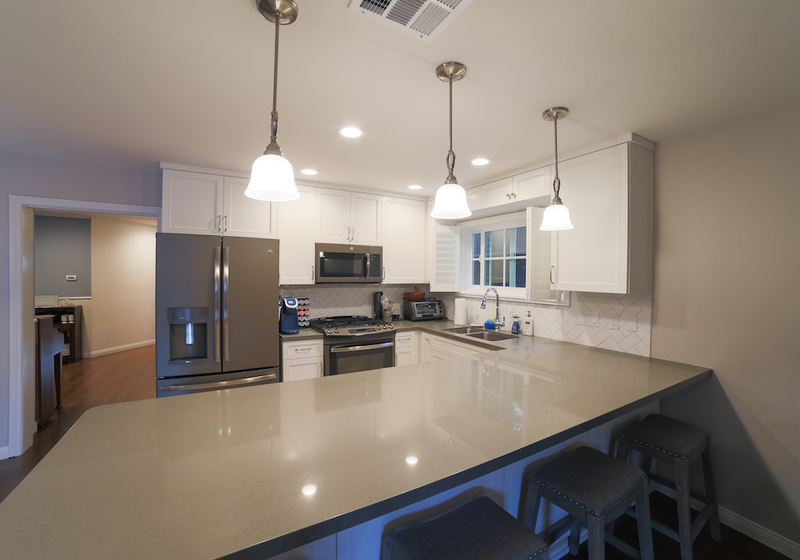 A great mid-range option for homeowners looking for something more cost-effective than granite or engineered quartz, but higher quality than laminate, solid surface countertops are non-porous, stable, and easy to repair. Solid surface materials are manufactured by Dupont Corian, Formica Signature, LG Hi-Macs, Samsung Staron, Wilsonart Gibraltar, and several others. Solid surface countertops come in hundreds of colors and patterns. The material is extremely durable, can withstand heat, the seams are nearly invisible, it can easily be repaired, and is easy to clean. It’s a great as an alternative to ceramic tile. Solid surface kitchen countertops can appear very generic, and will often lack the visual depth of granite, marble, and engineered stone countertops. An excellent option for a more cost effective remodel. No grout joints makes solid surface a maintanance free and easy to clean. Formica and Wilsonart are the major manufacturers of laminate countertop materials. In the the 1970’s and 80’s, plastic laminated counters were very popular. With the emergence of solid surfaces and the price drop in granite, laminate countertops are seldom used in kitchens these days. Plastic laminates come in a huge array of colors, textures, and patterns at a cost lower than any other kitchen countertop material on our list. Laminates will scratch, chip, and burn much more easily than durable materials. Plastic laminate is a suitable option for utility, storage, or laundry rooms - not so much kitchen countertops. Wood countertops offer variety and functionality. Hardwoods such as maple and oak are most often used as kitchen countertops. 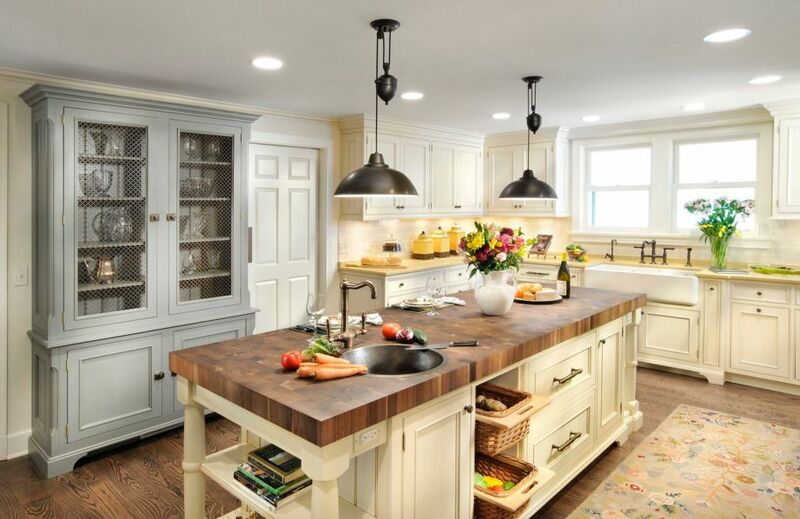 Wood and butcher block countertops are most frequently used for islands or an inlayed work areas in the kitchen. Wood countertops are easy to clean and provide a smooth work surface for cooking prep and baking. They can also be sanded and resealed as needed. They can be damaged by water and accumulate stains over time. Scratches in wood countertops must be oiled or sealed according to manufacturer’s specifications in order to avoid further damage or staining. A good option for islands when used in conjunction with other materials like granite. Due to the maintenance required, not a good idea for an entire kitchen. If you are looking for a contemporary, commercial look, stainless steel is a good choice. Stainless steel is heat resistant and durable. Because of the way stainless steel is extruded, there are no seams in stainless steel kitchen countertops. It can take hot pans and is very easy to clean. It’s also virtually impervious to water or bacteria, and doesn’t need to be sealed. Stainless steel can be expensive, noisy, and damages easily. Fabrication is expensive and you can’t cut directly on the surface. Stainless steel countertops will also plainly show scratches, smudges, and water spots. Although a popular option for those wanting an industrial, minimalist kitchen design, stainless steel is much better suited for commercial applications. Soapstone is a natural stone that ages nicely, with tiny scratches from normal use developing into a patina-like finish similar to fine silverware. Soapstone is very dense, will not stain or harbor bacteria, and holds up well in everyday kitchen use. It’s more durable than granite or slate, so cracking or chipping is less likely. Surface scratches can easily be repaired by the homeowner, and disappear when sanded with ordinary sandpaper then wiped with mineral oil. 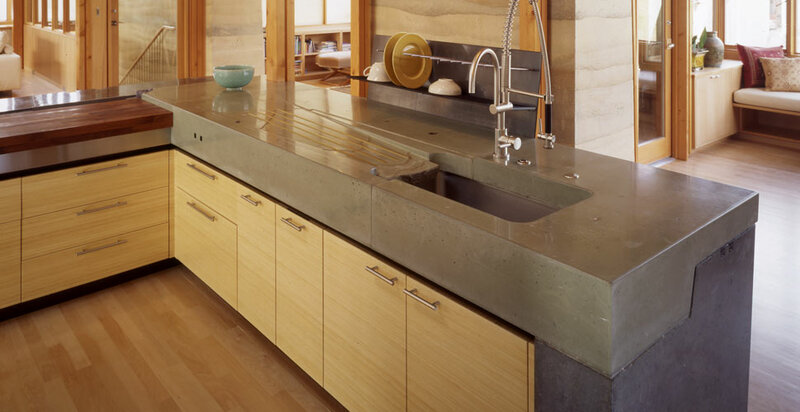 Additionally, soapstone countertops don’t require sealing of any kind. Soapstone is a a softer stone and will scratch relatively easily. Small slabs also retail at a relatively high cost per square foot ($75-$150/sq.ft.). Soapstone comes in limited colors of blue, green, gray tones, with varying veining. All soapstone colors mature to a deep charcoal gray over time. Depending on the area you live, soapstone selection may be limited, which can further inflate the cost. With a unique look and old-world feel, Soapstone is a great choice if you want something out of the ordinary for your kitchen countertop. Because natural marble is pricey and requires constant maintenance, it’s not frequently used for large countertop sections, but rather other kitchen accent areas such as an island. However, if you’re looking for a major “Wow” factor from your kitchen countertops (and you can afford to splurge), marble may be worth the investment. For starters, marble provides timeless beauty and a classy vibe to any space. Marble comes in almost unlimited colors and textures, making it easy to match with your kitchen’s overall design and style. Marble is very expensive and requires regular maintenance. It also scratches and stains easily, which may be a deal break for homeowners with small children or those looking for something a bit more durable. Using marble for accent areas or backsplashes is a great way to enhance granite or other kitchen countertop materials. However, it isn’t really practical for all kitchen surfaces. Looking for unique, modern, and minimalist without the cold, sterile feel of stainless steel? Concrete might be the perfect choice. Conrete kitchen countertops are equal parts industrial and rustic, providing a durable kitchen surface that is both functional and beautiful. Concrete countertops come in an unlimited variety of colors, stains, and textures, so are you aren’t stuck with the standard gray. It’s also very durable, requires relatively low daily maintenance, and can be cast in just about any shape desired. Contrary to what many homeowners believe, concrete countertops can be quite pricey. They are also prone to chipping and cracking, and require monthly waxing and re-sealing every 3 years to avoid prevent stains. For a contemporary look that is durable and 100% customizable, concrete is an excellent choice. However, be prepared for some necessary maintenance in order to preserve the look of your new concrete countertops for years to come. Want more kitchen inspiration? Learn about our kitchen remodeling expertise, or contact our team to schedule an in-home consultation and get started on your dream kitchen!